Relaxing in you private pool. 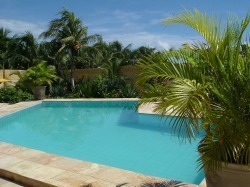 We must warn you , ones you tried the relaxing pool of Casa Kariri you might get addicted to it! Imagine that your favorite music is on and you have your favorite juice or drink in your hands. you probably would stay there for a very long time. If you get out of the pool its nice to dry on the warm healing and relaxing stones. Please be careful with the sun! 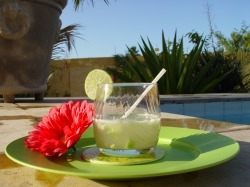 Go for the ultimate capirinha experience! We love to teach you to make the best capirinha ever but to have the best capirhina experience is to have it with good company , music, wind sun and water! This is a summer drink to appreciate before eating.